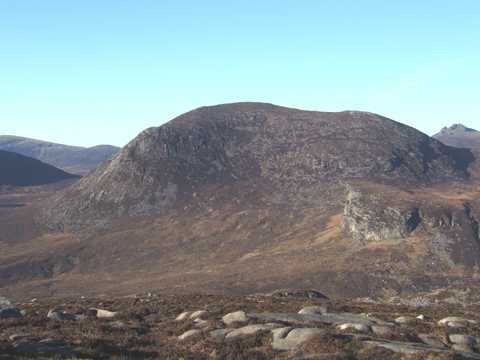 Slieve Lamagan is one of the roughest of the Mournes, and its south western side rearing above the col connecting with Slieve Binnian is the site of much grunting and cursing by hillwalkers engaged on its ascent. The peak takes the form of a south-north ridge with a lesser gap on the northern side, and with very steep (on the eastern side craggy) flanks. Park at Carrick Little carpark at J345 219 A, room for 10-15 cars. Note the carpark fills quickly on weekends but it is possible to park on the roadside nearby. Walk up the farm track next the carpark over a stile to open hillside. Follow a rough track beside a wall then forest then open ground. At J321 256 B on the col overlooking Ben Crom dam turn NE and pick your way up Lamagans rocky face following a rough, sometimes indistinct track to the summit. The aforementioned col can also be approached from the Ben Crom dam itself, following a recently constructed path up to just short of the col (at time of writing; the intention is that it will reach it in due course) before climbing up the rough hillside as mentioned previously. 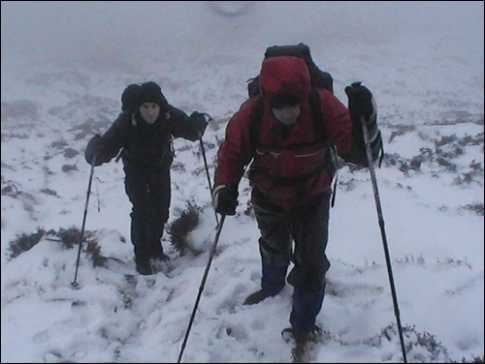 The summit can also be reached from the north over the intervening summits of Slieve Beg and Cove Mountain: the path up the Glen River from Newcastle followed by cutting down to the Brandy Pad constitutes the start of this route. The “Seven Sevens”. The intricacies of which I know nothing, the movers and shakers of which I know nothing and the finer objectives of which I know nothing. Essentially the thing is to ascend all the Mournes over seven hundred metres, in one day - such a day allotted, being evidenced by members of something, standing in yellow jackets at points and ….. pointing. 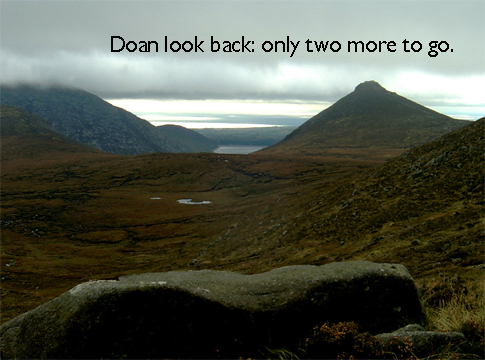 Having walked up Slieve Lamagan the previous weekend we decided that a more challenging ascent would be fun. With this in mind an attempt on a rock climbing route was called for and FM on the Lamagan slabs fitted the bill. 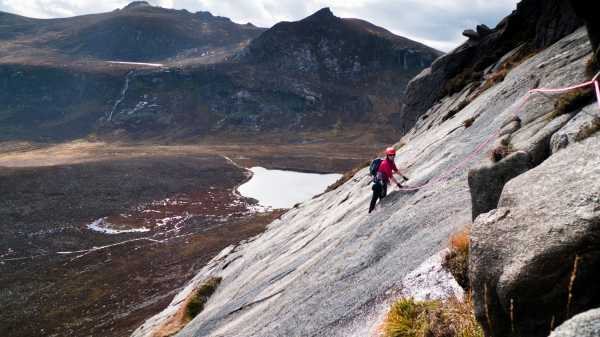 FM (rated V. Diff) is one of the longest multi-pitch routes in the Mournes with about 160m of direct climbing and another 200m or so of grade 1/2 scambling and walking to reach the top of Slieve Lamagan. The Lamgan slabs can be seen on the walk-in from the Carrick carpark and at first sight appear to rear-up as an amost vertical un-climable wall. Fortunately this is an optical illusion created by the perspective of the view from the footpath for upon reaching the foot of the slabs their true nature becomes apparent. The start of the climb can be reached by taking the footpath eastwards around the foot of Percy Bysshe before turning northwards to reach a path running along the foot of Slieve Lamagan. Follow this path eastwards again until a faint path at J 33250 24877 C can be taken up the boulder and heather clad footslopes of Lamagan. The rock climb begans at the foot of a white slab in a small gravel floored embayment at J 33159 25480 D. I won't describe the climb in detail as there is a good description in the recently published book on 'Rock Climbs in the Mourne Mountains'. But some points to note are: the rock is generally good and clean (mostly 45-55 degree slope), some parts are mossy and rock shoes are recommended; the crux is a step up onto a sloping ledge on the third pitch (this was wet on the day of our climb and I traversed left below the ledge for about 7m and then climbed a short overhanging wall to step back above the sloping ledge); protection is generally good but there are long run-outs on the slabs for the leader (an uncontrolled slide down the slabs wouldn't be pleasant). There is a commanding view of the Annalong valley during the climb with the floor of the valley appearing almost as a map beneath us. Every so often the minute moving dots of walkers could be seen on the paths below us, occasionaly stopping to watch our progress up the rock face.